Organized by Christina von Willisen, Sabine Pankau, and a dedicated group of volunteers from Hannover and Braunschweig, Germany, the second annual vegan Christmas market will be held on Dec 10th and 11th from 12:00h – 20:00h in Hannover, near the clock in the Steintorplatz. The market will offer vegan varieties of Christmas fare: waffles, German Christmas cake, cookies, and coffee specialties with soymilk as well as “glühwein,” (hot wine with spices), vegan döner, and sausages. According to Sabine, last year’s vegan Christmas market was such a great success that it even got coverage in a Berlin newspaper! She said she was “happy that so many people came to the last vegan Christmas market.” Christina and Sabine are trying to organize a vegan Christmas market in both Hannover and Braunschweig next year. 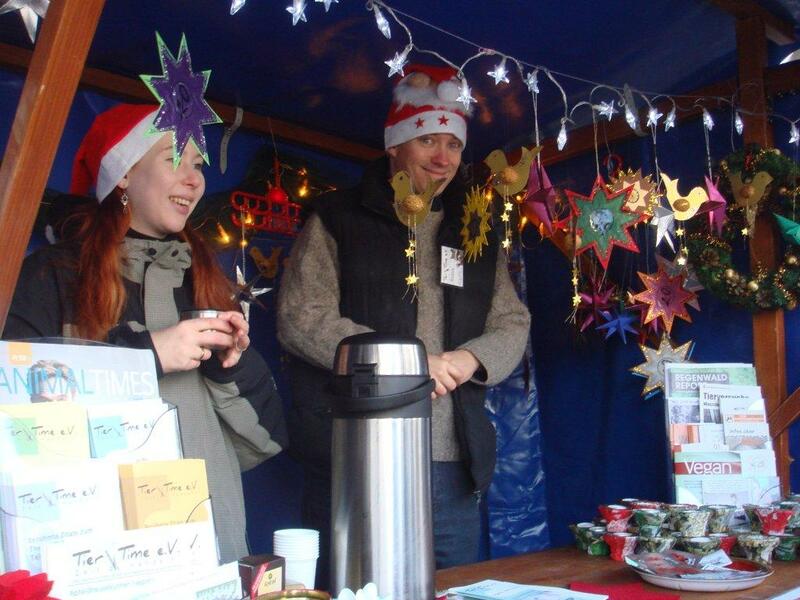 To get involved for next year’s vegan Christmas Market, you can contact them through their site. Congratulations Christina and Sabine for organizing such a wonderful event. Drink some glühwein for us, and from across the ocean, we’re sending a big “Prost” from the entire Yummy Plants team!